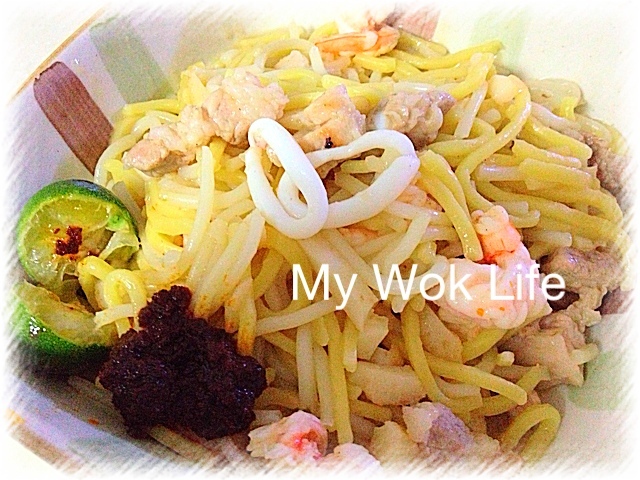 I couldn’t wait to share my latest cooking of this famous Singapore hawker specialty food with you! Another Singapore hawker food, which I have successfully cooked at home (laugh)! Thank you for “LIKE”ing this on my Facebook Fan Page. Your Like did encourage me to post it for you immediately (smile)! Yes, the Singapore Fried Hokkien Prawn Mee (Noodle)! Due to various account of the origin of this Hokkien Prawn Mee, I was already not quite sure why it’s called Hokkien prawn mee. Well, at least I knew this Hokkien prawn mee is commonly found almost everywhere in hawker stall, food court and even some restaurants in Singapore. Come back to my homecooked version… The types of noodles used in this Hokkien prawn mee are commonly found only in South East Asia. We called the white thick vercimili as thick bee hoon (粗米粉) or laksa noodle (due to its common use in Laksa dish), while the round yellow noodle is called cooked noodle (熟面) or yellow noodle (黄面). Some of these yellow noodle packagings even state it as Hokkien noodle (福建面). For this noodle dish, I couldn’t avoid, but to cook with pork lard due to its rather bland flavour. Yes, in order to elevate its aroma, pork lard would often be used. I try my best to eat healthily in my normal diet. Hence, cooking with pork lard was never my option. I wouldn’t purposely buy the pork fat just to fry pork lard for my usual cooking, at least… but, for this Singapore specialty, Hokkien prawn noodle, I see no way I could be spared from using the pork lard (since I have already skipped the MSG). It was my first attempt to cook this. I hoped to achieve as closer taste as those sold at the hawkers stalls. I wished to make an impression of this Singapore specialty food to those who have not tried this noodle dish before. Yes, yes. Anyway, bought the 3-layer pork belly for this dish. As you know, the pork belly often sold with a very thick layer of fat underneath its skin. I had to trim the top fat layer away and chop it into tiny cubes to make the pork lards, frying them in 1/2 cup of oil, and to be used as cooking oil throughout the entire cooking process…. This is the way I make pork lard.. (chuckles). By the way, this Hokkien Prawn Mee is not difficult to cook (simply observe some details which I have listed in my Tips at the bottom of the post). It’s the preparation that wears you out, probably… Be prepared to spend more time in preparation, and the cooking takes you probably only 10 minutes. Remember to prepare everything in advance, but cook it only right before you are ready to serve and eat immediately. Cooking it in advance is not recommended as the noodles will dry up and turn soggy in minutes! So, you have to either eat it up immediately, or add more stock to make the dish much wetter to withstand from drying up too soon. And, don’t forget to garnish before serving it. These garnishing are important to bring this rather bland-flavored noodle dish to its perfection! How we do with the garnishing is to squeeze the half lime over the noodles, and then, use your cutlery to mix the noodles well with the sambal chilli which to be served by the side. Sambal chili, get one off the shelf. It costs you less than S$2 to get a small bottle of the ready to eat sambal chilli which is good to be used in other cookings, for instances, stir fried long beans, French beans, lady fingers and even meat dishes. If you wish to see the sample bottle of sambal I am using, go to My Wok Life Facebook Page to view it! As for the lime, get the small lime and not the big Thai lime. (1) Handling of prawns: Shell, but do NOT discard the heads and shells. Rinse, pat dry and set aside for later, after removing it from the prawns. As for the prawns, slice across the back into halves, devein and clean. Set aside for later. (2) Handling of pork belly and creation of pork lard: Trim away the pork skin from the pork belly, but retain the underneath fat. Simply separate this top layer of fat, leave only second and third layers of fat in the pork belly. Cut this separated top fat into cubes which to be used to fry pork lard later. As for the remaining pork belly, slice it. (3) Cooking of pork lard: Heat wok with oil over high heat. Add pork fat cubes and fry till crisped and golden. Watch out fire not to burn the pork lard. (4) Making of prawn stock: Retain half the oil in wok after frying pork lard, and transfer the remaining oil and crisped pork lard cubes to a dry bowl for later. Add prawn heads and shells to the wok and fry, but refrain from constant stirring, till slightly crisped and aroma releases. Yes, just spread the heads and shells in the wok, and let it cook with occasional stirring only. When both sides of the prawn heads are slightly browned and crisped, chop to crush the prawn heads with the front edge of the spatula. Then, drizzle 1 tablespoon of chicken stock in circular motion to create some sizzling effects as well as yielding more aroma. Stir fry a little before adding the remaining stock. Reduce heat to medium fire, and let it simmer for 15 minutes before heat off. Sieve the prawns substances and transfer the stock into a bowl for later. (5) Blanching of noodles: In order to cut short cooking time, and most importantly, eliminate as much alkaline taste of the yellow noodle as possible, quick blanch the noodles beforehand. Simply put the noodles into boiling water (over high heat) for 10 seconds. Quickly sieve and transfer into a large bowl for later. Heat wok over medium fire and add the other half amount of pork lard oil. Add in garlic and stir fry till fragrant. Then, add pork belly slices, stir fry till almost cooked, followed by addition of fish cake shreds. Drizzle sesame oil and soy sauce, stir to mix well. Return blanched noodles into wok, followed by prawn stock and pork lard cubes. Then, add in prawns and squid rings. Reduce heat to low fire. When all ingredients are cooked and noodles are softened, but still remain wet with some prawn stock as its gravy (prawn stock should be present in the end of the cooking. Do not cook too long till prawn stock dries up), beat in egg(s). Stir well to combine. Heat off and garnish. Serve immediately. Tips: For pork belly, choose those with 3 layers of fat including the top layer underneath its skin, as stated in my recipe. Otherwise, buy separate pork fat to cook the pork lard. To cook the squid into soft and tender texture for more superior chewing effect, slice the squid into deli-thin rings (about 0.5 cm thick), and cook it with minimum time (usually 1 minute or so will do). So, you may choose to add the squid rings only at the very last stage, 1 – 2 minutes towards the end of the cooking process. Step (5) is optional. If you do not mind or not sensitive to the alkaline taste yielded from the yellow noodle, skip the blanching step. Simply simmer the noodles 1-2 minutes longer during the cooking process. Wow… That looks like a lot of steps… but definitely worth the effort for a plate of good Hokkien Mee. Delish! My wife loves this dishes until we move to Vancouver, BC. ps: Appreciated if you let us know how to make the sambal chili to spare with this Hokkien Mee too. Hi Dave, thanks. I think I have the recipe. Give me some time to find it for you or post if it isn’t yet. Your version looks way better than what I get from the hawker centers. specially with the addition of pork.. Looks less oily too. I really love hokkien mee, but never tried making them at home before. Now that I’m staying overseas, hope that this will motivate me to make this soon! Hi at which point will the eggs in the recipe be added ? Hi at which point of time will the eggs in the recipe be added? Last step as stated in recipe. Best egg and stir fry few mins before heat off.